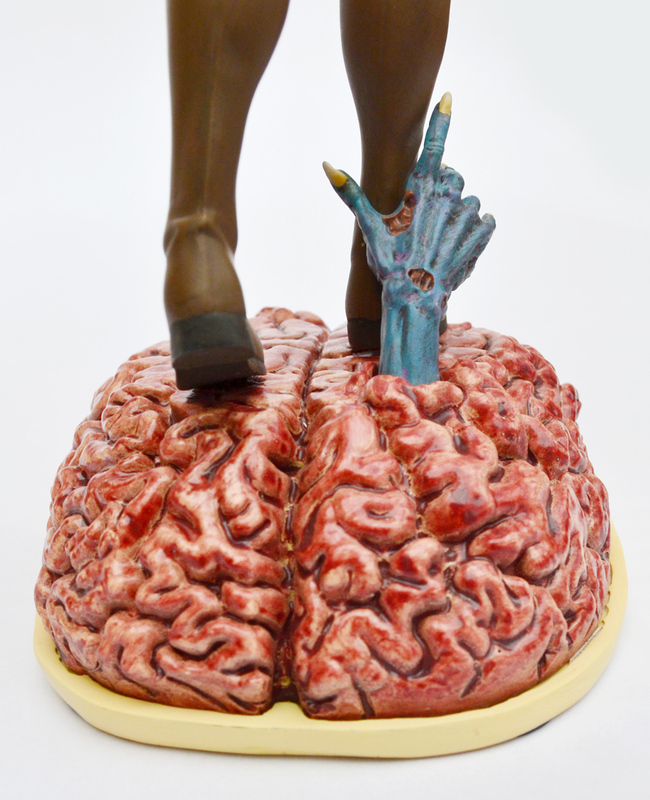 iZOMBIE statue | 'TAIN'T THE MEAT… IT'S THE HUMANITY! 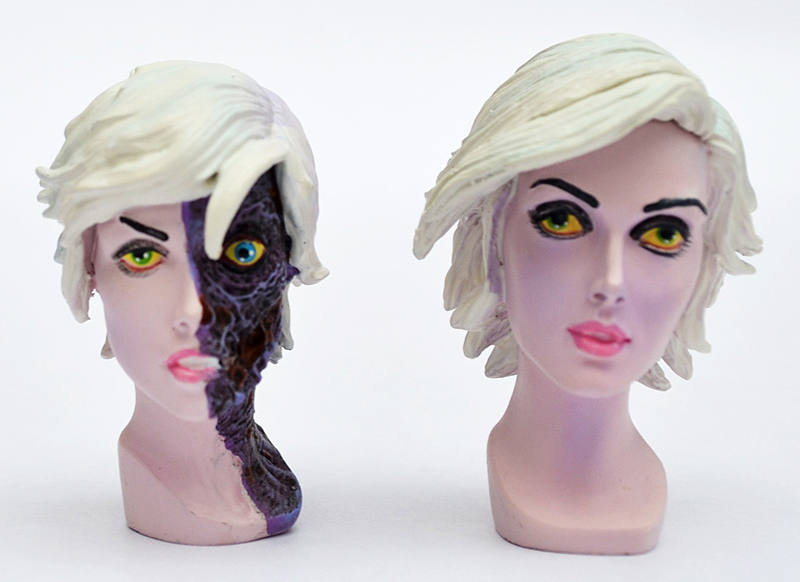 After a gap of several years I’ve been bitten by the statue-collecting bug again, and have unearthed this creepy little gem from DC Collectibles featuring Gwen Dylan, star of DC Comics’ iZOMBIE. iZOMBIE has a short lived, Eisner Award-nominated DC comic that ran for 28 issues between 2010 and 2012. Written by Chris Roberson and illustrated by Michael Allred, the comic recounts the adventures of grave-digger Gwen, who must consume a human brain once a month or transform into a mindless zombie. She is supported by a group of other supernatural oddballs as they battle an extra-dimensional horror straight out of a HP Lovecraft yarn. Released in November 2014 this cold-cast porcelain statue was sculptured by Phil Ramirez, and based on a design by Allred. The statue measures 11 inches in height and depicts Gwen standing on a bright red human brain, while a creepy hand reaches up to grab her ankle. The statue comes with a choice of two heads: one that’s half human and zombie, and one that’s all human. The statue itself is ghoulishly good. Ramirez has done a great job interpreting Allred’s design and the sculpture is finely detailed — I particularly like the rotten flesh of Gwen’s withered arm and leg. The paintwork is also very well done, with some nice flourishes on the brain at the base of the statue (the purple pigment on top of Gwen’s zombie head is also a nice touch). The choice of heads is novel too; I prefer the zombie one as it better matches the rest of Gwen’s body, but it’s nice to have the choice. As for the packaging, iZOMBIE ships encased in two thick pieces of polystyrene, while the statue and the heads are individually wrapped in plastic. Although the iZOMBIE comic was short-lived the basic concept was picked up by The CW as a TV series that is now approaching its third season. Produced by Rob Thomas (of Veronica Mars and Party Down fame) the show eschews the more Lovecraftian elements of the comic for a more TV friendly police procedural. And it works surprisingly well. Rose McIver is excellent as zombie Liv Moore (not Gwen Dylan) who solves crimes utilising the memories of the brains she consumes. The opening titles are illustrated by Allred and the show is smartly written, witty, and at times quite gruesome — it’s also terrific fun. 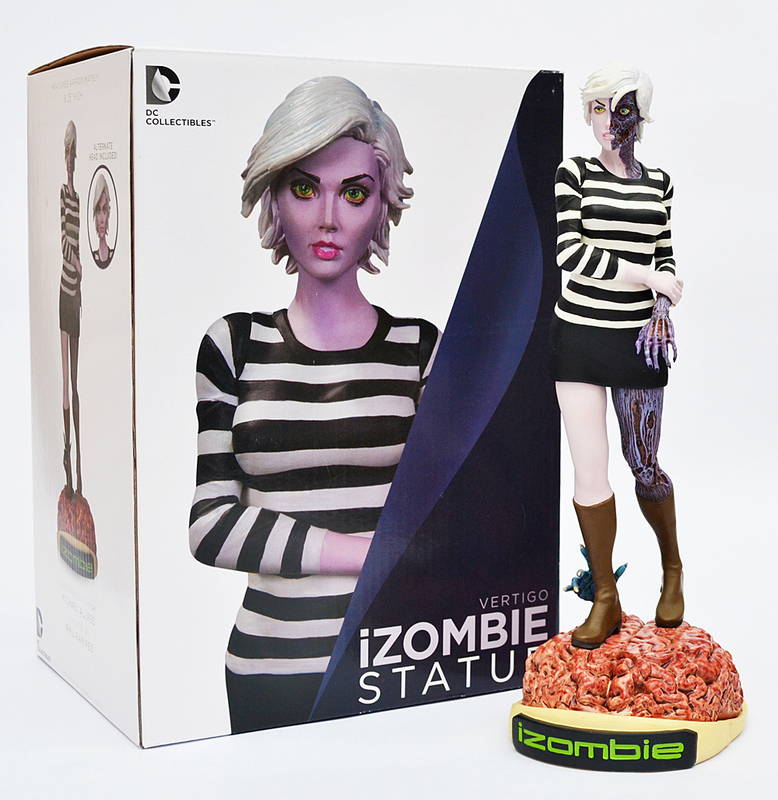 The iZOMBIE statue was released with a RRP of $99.95, but shop around and you can get it a bit cheaper; I paid £70 ($85) for mine and it’s well worth the expense. After a gap of a few years I’ve suddenly gotten back into collecting statues, with this being the third DC Collectibles piece I’ve purchased recently (the first, The Sandman Overture, is here, while Batman and Killer Croc is here). All three have been of an extremely high standard. I have one more statue to look at, The Dark Knight Returns: Superman/Batman statue, which I’ll be looking at very soon.